While quadrotors might just become the killing machines of choice some time in the future, we’re pretty sure it will be awhile before they run amok and wipe humans off the face of the planet, if the following video is any indication. The team over at UPenn’s GRASP Lab film everything they do when it comes to quadrotors for posterity’s sake. When your awesome job consists of directing quadrotors through all sorts of acrobatic hijinks however, mistakes are going to happen. Thankfully, the team doesn’t keep these a secret, and while we’re typically wowed by what these flying machines can do, it’s also pretty fun to see them fail in such spectacular fashion. If you have a spare minute, kick back, fire up the video, and enjoy the mechanical mayhem that ensues. We certainly sleep better at night knowing that while these things are awesome, a well-placed hula hoop is all it takes to ensure continued human supremacy. They may be bloopers, but some of that flying that they are attempting (e.g. putting a copter through a vertical slot or locating and flying through a hula hoop)is pretty damn impressive! Mass quadrotor suicide at 25 seconds! Is this humane what were making them do? It appears they just cant take it. I love the sound of angry quadrocopters. Bring on judgment day! These guys are using a movie studio quality motion capture rig with near 100% position certainty and mm resolution. All processing is done off the copters. They may be getting really good at control systems and cooperative behavior, but there’s not much that can be applied to real world situations. Disclaimer: I work for a Naval research lab that specializes in vehicles with onboard autonomy and multi-vehicle cooperation in GPS denied or low position certainty environments. IE, the real world. This group’s videos get passed around the office every so often and get a few chuckles for research being done in a non-existent perfect world. I don’t know what the propellers are made of, but if that guy :32-:40 took one in the face it wouldn’t have been pretty. A: No; twas quadcopter awesomeness. Net or no net, he ought to have had a face shield. @Bill: Let’s say you’re building an autonomous ‘copter, that works under real-world conditions, and of sufficient size to accommodate all processing on-board. In that case, although the location system cannot know the position of the ‘copter and surrounding objects with certainty, it would continually generate “best estimates” which would be passed to and considered as exact locations by other systems, including the control system. And the control system would still be much like what these researchers have developed to an uncommonly high degree of precision. So even though they’ve chosen to focus on a specific area while “cheating” on the others, I don’t agree that this has no real-world application. The control system alone is an essential part of any real-world app. stuff here is pathetic to watch ! be building “real world” versions of them). 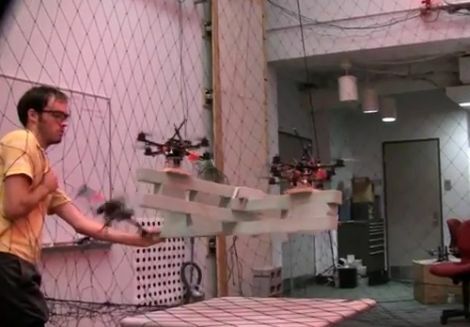 If one quadcopter can control its 4 rotors, then maybe a 4×4-copter can be made from 4 quadcopters, where each “meta-rotor” is a single quadcopter. And then a 4x4x4-copter where each meta-meta-rotor is a 4×4-copter. A scalable copter design based on fractals. Don’t they need to start somewhere? Develop something that works in a lab and then expand to real world? There are steps to these things. I don’t know if the Navy goes straight from concept to real world, but around here we test and test and then move on in small controlled increments. While it makes sense in theory, in practice systems designed from the ground up in a perfect world environment behave very poorly in the real world. I have seen many examples of this. Systems designed with the expectation of bad data do better in a real world environment. I assume you mean Bill? No, we start in simulations that introduce errors on purpose to model real world problems, and then quickly move to real world tests asap. Personally I prefer the non-blooper videos that youtube offered up after this bloopers reel. I can see what Bob is getting at and he apparently has his Naval research to back up what he’s saying, but meh, I think it’s fine to start in a ‘perfect world’ environment and then later perfect/tweak/modify it for the harsher “real world”. LOL so many anonymous experts posting comments on the web. Just the opinion of an anonymous critic. As for no real world applications, haven’t people been saying that for ages? The first person to put a sharp rock on the end of stick was probably dismissed by someone. Not that I’m saying there aren’t real world application for these machines, just that I wouldn’t say there isn’t. Fun to watch though. I wish they would tell us the number of takes to get it perfect. Also, i love this video series. Not everything that flies is designed to kill and destroy. I can see many real world applications but I guess you were stuck in the army box too long. @henry: well hopefully it worked all the time after that… it would be quite bad research if they took 20 takes to get it right. b… but does it cure cancer?????? magnificent men and their flying machines”. platform designed to simulate the LEM). in “Space 1999” (4 corners w/lift devices). Or maybe a “Thunderbird 2”. Eh, not my money, more power to ’em. I like what Bill said about real world applications having to deal with bad data. also, did anyone know Schadenfreude is germnan fo the Joy of other Peoples misfortunes. Not to be confused with Scheidenfreude the Joy of pleasuring Vaginas. so what do you propose instead of quadrocopters? The advantage of a quadrocopter is that it is much easyer to build in small scale.. the rotor is simply some blades fixed to a hub and no complicated linkage needed. So quadcopters are much cheaper to build and much easyer to repair than real helis of this size. PHT3 probably proposes standard configuration, ie one large rotor and one smaller mounted sideways on tail. Tail rotor in that config. just eats power to prevent the heli. body to enter a spin. With quadrotor all the energy goes into lift… Just saying, I’m no expert like PHT3. In defense of the institute creating these videos, I’ve seen most of the “good” videos those takes are from, and even given the “perfect-world” scenereo the experiments are taking place in, they’re pretty impressive. The failures, on the other hand, are hilarious. Have to agree with the other people who said the guy inside the net needed a face shield. He looked visibly uncomfortable. Anyone who has seen all the videos in this series should refrain from using the word ‘unimpressive’ as a descriptor. On a good day, these things are graceful and terrifying. While sensing is a problem today, the state of the art for sensors and mobile processors is advancing. Also, I’m sure that much of their software algorithm is highly parallel, and could be adapted nicely to some FPGA’s or ASICs. My first thought on the control issues may be in the phase alignment between the transmitting antenna and the receiving antenna as they cross over the vertical/horizontal alignment planes. There’s a null point, or a point where the phase angles cross over and the RF signal is all but eliminated (or at the least, greatly diminished), which may be causing a loss of control. I love every video these guys have made. It’s like watching something out of science fiction. And Bill, yes we all know these aren’t done with on board processing and sensors. To me it’s still amazing. one advantage that quadrocopters have over helicopters is that it requires less powerful motors, with the downside of needing MORE of them and the subsequent downside of having more motors to maintain, as mentioned no need for a side motor for stability so all energy is put into lift. i cant say that an electric engine is easier to control with a computer its very likely that is false but i dont know.